The best feature of the Skyrim game is its sense of exploration. Simply trekking around the world and suddenly stumbling into a long lost ruins or a beautifully hidden glade can be a magnificent experience. Unfortunately the effect can be spoiled, because exploring some areas too soon can break the quest chain later on in the game. I found I was often afraid to visit a dungeon unless I already had a quest leading me there. Despite my best efforts, I still managed to break a quest chain in Riften later on (Supply and Demand) by clearing a dungeon to early. Though I was able to fix it with console commands (PC superiority *cough*), I got the idea for a mod that would edit the map so that you could scroll over any dungeon that you come across and It would tell you if there was a quest you needed to get before diving in. While I wanted this to be a simple mod, and indeed it was a relatively easy change to execute, it certainly was not quick. Most of the work I put into this mod required a bit of data entry and research - the most time consuming of which involved going through the community Skyrim Wiki and looking through more than 200 different locations to find out which dungeons have quests that needed to be flagged. I ended up with a 15 page word document containing all of the locations in the game. This current list also includes a lot of additional information about the dungeons, in case I want to extend the features of this mod in the future. The next thing I had to do after collecting all of this data, was to decide the exact scope of what I wanted this mod to do. At one point I had considered adding additional information to the dungeons, such as if they contained a specific type of treasure or collectable. In the end though, I decided that the general spirit of this mod should be one that promoted exploration while minimizing spoilers. The Skyrim tutorials are amazingly in-depth, easy to follow, and even have supporting videos you can follow which reinforce the material. The first set of tutorials starts you off with the level design series, showing you how to move around a 3-d space and interact with the various features of the kit to manipulate a level. Getting used to moving around a 3-d space is a little awkward at first, but mostly it was just learning all of the key combinations and commands to navigate the space. The amount of assets provided in the game, that is to say each individual dungeon piece, art, or physical object; is completely overwhelming. There are over a hundred pieces associated with just one type of dungeon, and that is only a fraction of the number of assets it is possible to place into the game. The only way you'll ever be comfortable grabbing the piece you need is after you've used them for a while. But the mod I wanted to create had a very specific focus; I wanted to edit the world map. Looking through the list of options and assets, there was no apparent option to bring up the information on the game map, let alone edit any of the data it uses. Eventually I noticed in the level design tutorial, that further on there was a tutorial for adding your newly created dungeon to the world. It seems that the Skyrim map isn't a separate UI (user interface) menu, but that it is in fact generated from all of the exterior cells in Skyrim. All of the map markers that show up on the map are placed in the world, at each specific location/cell in the terrain editor. This also means that editing the text on that map marker would change the name of the zone in question when a player walked into it. This was not ideal, but for now I didn't have a better solution as to how to change the map text display. After finding this out, it was relatively easy to enter the specific location I wished to edit in the assets search bar, and then edit the map marker in that cell with the information I wanted. 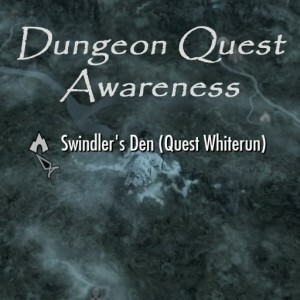 Of the over 200 locations in Skyrim, there were about 30 that needed to be updated. That part of the mod work only took me about an hour to complete. Another 20 minutes to edit some screen shoots to go along with the mod and it was ready to go. Looking up on the Creation kit wiki for how to upload my final project, it turned out to be ridiculously easy. In the Creation kit menu's, there is a button that lets you upload your currently active mod to screen. All it requires is you to enter a name, a description, and optionally add a picture. Afterwords, hit submit and about 10 seconds later my work is in the wild for the whole world to see. In the hour since I've uploaded the mod, it has already been viewed 50 times and subscribed to about 20. Of course that's nothing all that special compared to the mods that have tens of thousands of subscribers, but the ratio of people who actually click on my mod to those who decide to use it is surprisingly high. I'll have to revisit this after it's been up for a few days to see if there is any feedback, but overall I've found this part of the project to be a success. It was a relatively simple mod, despite the amount of hours it took to gather all the information I needed, but it was definitely a good start. As for my aspirations to create a more involved level designed or scripting mod, that is going to go on the back burner for a bit. I'll still continue to work at the tutorials, and will post any interesting experiences I have with learning how to use the kit; but there are a few more basic computer science projects I wanted to get to first in the coming weeks. Of course if anyone has any suggestions as to what kind of level design or scripting mods I should tackle when I revisit the creation kit; I'd more then welcome the inspirational input. Update: 24 hours after publishing the mod on both Steam and Skyrim Nexus, it has been downloaded 900 times and gotten lots of good feedback! Apparently lots of other people have felt the same way about this problem as I have. The mod is currently uploaded to both the Steam Workshop and the Skyrim Nexus Community Mod site. This entry was posted in Games, Project and tagged Creation Kit, Modding, Skyrim, Steam Workshop. Bookmark the permalink.